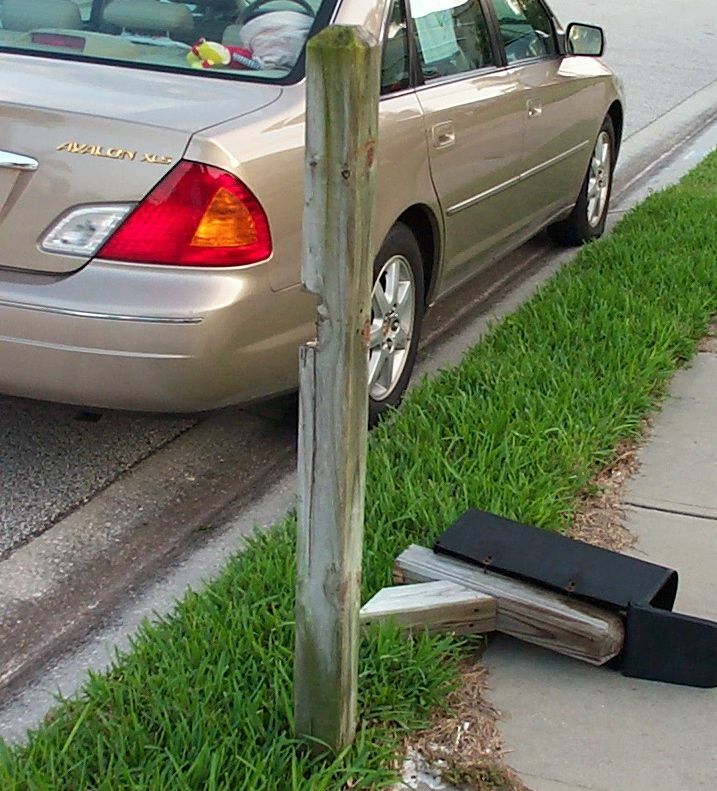 We’ve had the worst luck with mailboxes in the last few years. As far as I’m concerned, they are simply a nuisance. As evidenced by the fact that I’ve had one JUMP RIGHT IN FRONT OF ME when I was riding my mother-in-law’s bike a number of years ago. MY MOTHER-IN-LAW’S BIKE. I’ll let that sink in. You’d think that once you learn how to ride a bike as a kid, you’ll never forget. That would be an incorrect assumption. A couple of years ago, my SIL plowed down our mailbox. In broad daylight. And I was all okay with that because I was in the market for a non-black plastic mailbox. It had been the one that came with the house, and we were the last house on the street to replace it. And so I then got my shiny white metal mailbox, but still had to settle for the fact that it sat atop the old ugly mailbox post. I vowed to paint it. In my spare time. My spare time never came. Last week we got a timid knock on the door. A sweet little old lady in a bright red Christmas sweater stood on our stoop to tell us that she mowed down our mailbox while out looking at Christmas lights. Understandable since we were the only dark house on the street. We neglected to decorate the exterior of the house, what with the Great Stomach Virus of ‘09 and other general hell we experienced throughout the month of December. 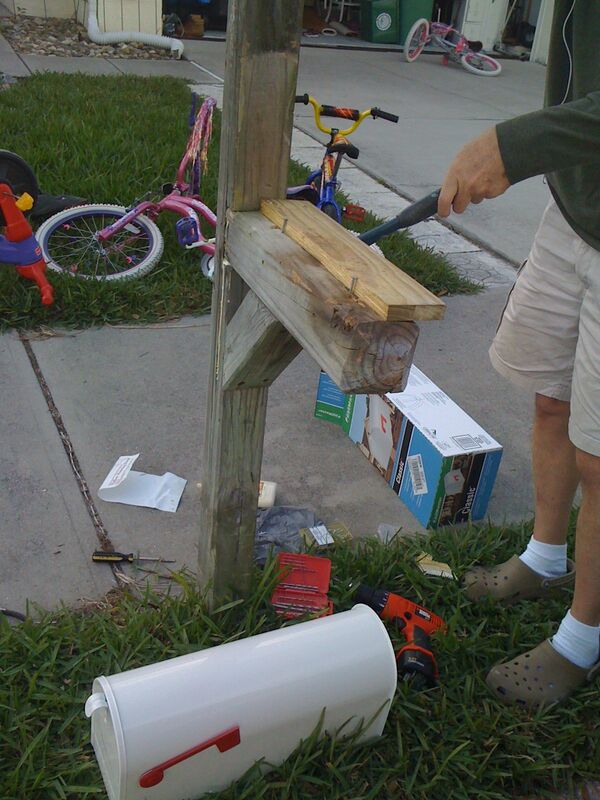 The sweet little lady apologized profusely and offered to send someone over the next day to install a new mailbox. My heart skipped a beat. OH BOY! A CHRISTMAS MIRACLE. I’m going to get a NEW mailbox!!!! And then I heard Fiddledaddy tell her thank you, but it isn’t a big deal and she shouldn’t worry about it. He wished her a Merry Christmas and sent her on her way. Of course that was the Christian thing to do. I sighed, as I kicked my toe into the baseboard. And so for the last week the mailbox has been hanging precariously onto its last rusted screw. Tilting sideways, not even the neighborhood dogs would come near it. We made the trek to Lowes and purchased another shiny white metal mailbox. I lingered a while longer in the mailbox aisle, dreaming of a shiny new white mailbox post to go with it. Or a Manatee Mailbox, anything. 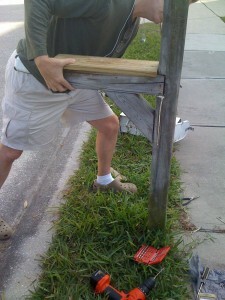 Alas Fiddledaddy determined that he would simply fix the sad old decrepit post. This afternoon he got out his trusty tools and got busy. He worked up quite a sweat trying to piece the old girl back together. I was especially helpful while I stood nearby taking pictures and generally discussing the merits of a shiny white NEW mailbox post. While giving him helpful tips about using super glue and bright blue electrical tape. He has now determined that what he needs is some sort of bracket to keep all the pieces together. Yes. THAT WILL LOOK AWESOME! As I peered out the window tonight, I saw the old mailbox post leaning into the wind, with the old scarred and dented mailbox laying beside it on the lawn. I’m waiting for the letter from our intrepid Homeowners Association. I just don’t know where they’re going to put it. I’m going to go out tomorrow and staple an old shoe box onto the post so that our mail can actually be delivered. And I’m considering letting Cailey get out on her bike and cruise the sidewalk. Since she still hasn’t mastered turning or stopping, I just may get my new mailbox post yet. I had to chuckle at the first pic of your dear fiddledaddy with the post across his face – I immediately thought of Wilson on Home Improvement – nice cover! I am also green with envy at what looks like gorgeous weather. I live in NY State – need I say more? My parents live in Spring Hill, FL from Oct – April. Due to budget cuts, we can not make a trip down in 2010 🙁 Oh, well, I do have a new granddaughter to brighten things up! TeeHee! We’ve had the same problem with mailboxes this year. Same metal post but new plastic mailbox #3 arrived about a month ago. Hubby is not handy so I get to do all the house repairs. Good luck on the new post! Our mail box has been knocked down about a gabillion times by our neighbors. The first time, they replaced my locking mail box ($55) with a basic box ($10). Yea, that made me happy. The last time they “repaired” it with some wire holding the vertical break together. And so my mail box began to lean towards the street. Finally, when it hung so low that I was in danger of not getting my mail I insisted that hubby had to do something! Enter the steel post. I’m not talking some sissy little steel pole, I’m talking 8 inches across STEEL post! Needless to say it’s still standing. Would you like me to send my neighbors over so you can get a new mail post too? Oh I dream of the day we get a new mailbox and post!! We bought our house 9 years ago and it has the same mailbox that was installed when the house was built…in 1959. It has a big “R” attached to the post. Did I mention that our last name starts with “D”?! Or the fact that the only other owner of the house’s last night started with a “M”?! Alrightythen. Ohmigod. Great story! We avoid this by living in an apartment that offers no mail services (so we have to do the post office box bit), but with the way the blue-hairs around here drive, I know a myriad of people who have had to replace their mailboxes for similar reasons. The other day we actually heard the tell tale sign of someone backing over a curb and cruuuunnnnnch, right into some poor saps mailbox. And not one of those cruddy black mailboxes. No, we’re talking a relatively snazzy, artsy-fartsy hand painted mailbox on a wrought-iron post. The mail box? Ehhh, tin doesn’t survive a Cadillac backing up at the blazing speed of .04 miles an hour. That made me laugh out loud, then I remembered a story involving one of my sons high-school friends, a snowy/icy street, a sled, and a steel mailbox pole. And a broken nose. Then I laughed some more. Okay … a home repair picture taken outside and the “repairman” is wearing shorts? Green grass and bikes in the front yard? Is that really what Christmas is like there? I’m facing a flight from PA to OK in the morning with snow and ice in both places. Maybe I should divert to your neck of the woods? Oh, and I second the comment about Wison on Home Improvement. I thought the exact same thing! Your blog makes me laugh and for that I thank you. I think my favorite line so far is on this post, “Insert maniacal laughter here.” I did. Maybe you’ll enjoy my blog and if so, please subscribe. I write it with my grown daughters (yes, shockingly they do grow up!) and we crack each other up. Maybe it’ll make you smile as well.